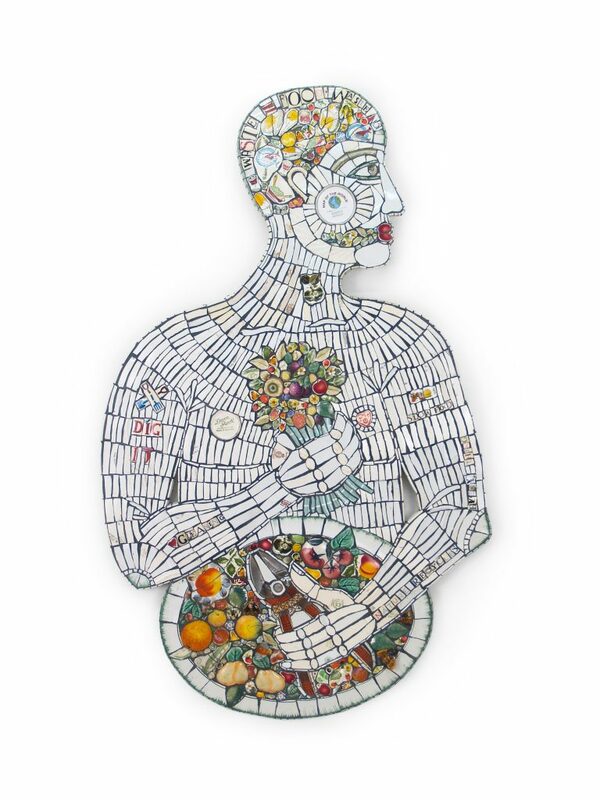 With a National and International reputation, we are delighted to welcome Gloucestershire based Mosaic Artist, Cleo Mussi, as a guest exhibitor with the Guild at 51. Cleo graduated from the Textile Department at Goldsmiths in the 1980’s. Since then, Cleo has found that her interest in recycled fabrics, knowledge of pattern, print, weave and stitch, translates easily into reclaimed ceramic. For ‘A Harvest Festival’, Cleo Mussi celebrates her joy of gardening and growing produce. A Green Man/Head Gardener with bountiful baskets of fruit. Vegetables, bees, birds, over-laden branches and bunches of flowers all drawn in reclaimed ceramic. Nature recycles everything.